Will BRICS rescue eurozone from disaster? The G20 summit in Cannes underlined the emergence of BRICS as a global player as these major emerging economies took a joint position towards the eurozone crisis. The much-hyped G20 summit in Cannes did not produce any spectacular results. But it will stand out for highlighting the larger shift of economic clout to BRICS nations whose leaders decided to work out a joint position on managing the eurozone sovereign debt crisis. Clearly, major emerging markets have a stake in preventing a financial disaster in Europe because it would inevitably spread to other regions. The EU is the key trading partner for BRICS. China’s trade with the EU stands at 35.6 billion euro, 800 million euros more than the EU’s trade with the USA. For Russia, the eurozone accounts for 50% of its foreign trade and 45% of its currency reserves. If the Greek contagion spreads to other debt-ridden EU countries, a new world financial crisis is guaranteed. Experts reckon that 1 trillion euros will be needed before the end of this year and another 1.5 trillion next year to contain the crisis. The European Financial Stability Fund (EFSF) can’t resolve this problem alone. The hard truth is the eurozone badly needs the BRICS’ combined financial muscle. “The appearance of a common BRICS position means that it’s becoming a real global player. It is worth the effort. These countries can meet the challenge”, says Nikita Maslennikov, adviser to the Russian Institute of Contemporary Development. 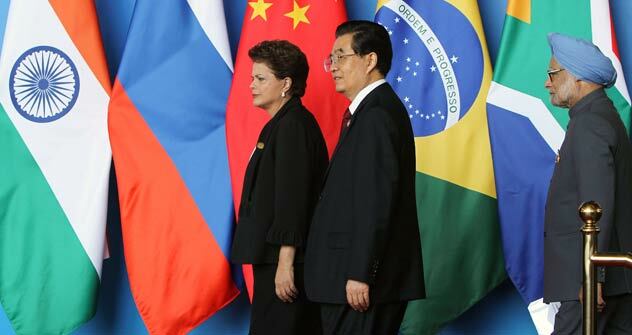 It’s “the start of the process of BRICS positioning itself as a subject of geopolitics. It is already a player in the world economy but it has yet to emerge as a player in global politics,” he stressed. BRICS countries have been discussing options for helping the eurozone since September. They have the backing of the IMF, as its head Christine Lagarde has often repeated. This is all the more important because the IMF could provide the most convenient channels for delivering such aid. “The overall picture shows that BRICS countries tend to solve issues collectively. That means that BRICS will channel its aid to the Europeans through the International Monetary Fund”, says Maslennikov. Lavrov’s statement is further proof that Moscow is reluctant to lend money directly to the European anti-crisis fund (EFSF), experts point out. In mid-October, Russia had indicated that it was going to lend the eurozone $10 billion. At the Cannes summit, Russian President Dmitry Medvedev reaffirmed that this was a possibility. Beijing has already bought 100 billion euros worth of Italian debts and EFSF head Klaus Regling has held talks in the Chinese capital on a further $100 billion loan to the Fund. “BRICS aid to the EU is a distinct possibility”, says Andrei Mordavchenkov, financial markets operations director with the Partner company. It can be channelled either through the IMF in the shape of credits, or through purchase of the much-touted EU bonds.” “Financial support for the eurozone by major emerging markets is highly probable,” says Bogdan Zvarich, chief analyst with Net Trader company. The leaders of the BRICS countries agreed to help the eurozone at the G20 Cannes summit.